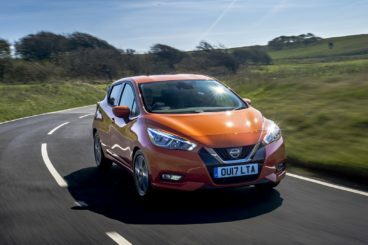 Looking for an objective review of the Nissan Micra Hatchback Diesel? OSV has got you covered, from engines to lease deals. The new Nissan Micra Hatchback Diesel is unrecognisable. If you remember, the Micra used to look dowdy (but still somehow managed to scoop the 1992 European Car of the Year award), and then it started to look round and cute as Nissan brought it in line with what the punters wanted. Now, it looks sharp, edgy and ready to do business. Its newfound sense of style has turned it into a very desirable small hatchback. It’s still as much fun as it always was, and it still retains its bubbly character – it’s just that this time around, there’s a bit of an edge. But is that enough to make it your number one choice? 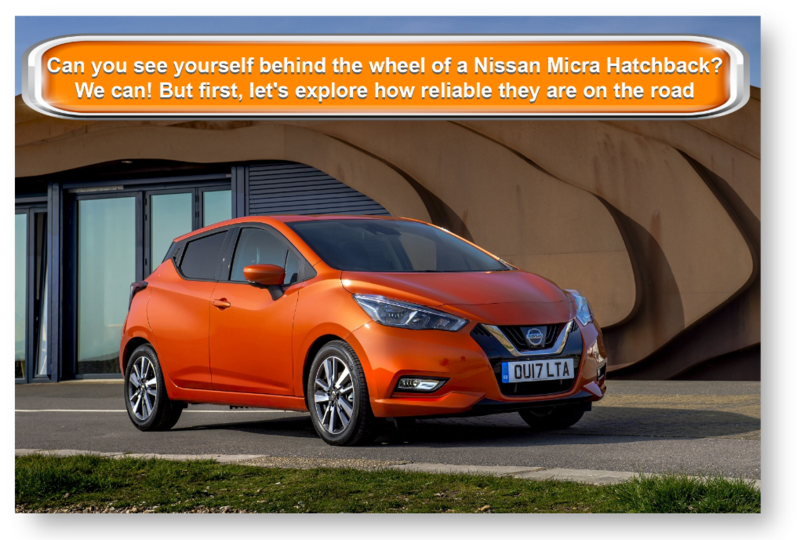 OSV takes a closer look at what it’s all about with our 2017 Nissan Micra Hatchback review. Nissan may have tried to match the Ford Fiesta’s exemplary drivability, but then realised that it was an impossible task. Or they may have just not bothered at all! Whatever the case, the new Micra isn’t going to topple the Ford’s handling crown anytime soon, but it IS a very good all-rounder. It’s fun, and offers neat handling. Nissan has judged the steering weight well. It’s fairy light, which makes it easy enough to mill about the town, but stiff enough so that it doesn’t twitch at the lightest of touches on the A roads. It’s a bit vague overall, though, and nowhere near as entertaining as the Ford. However, you can still bend with confidence, thanks to the brand’s Active Trace Control and Active Ride Control systems. A 0.9-litre petrol engine kicks off the engine range. It’s borrowed from the Smart ForFour and the Renault Twingo, and is an enjoyable little power plant that delivers up to 88bhp. That’s enough to get you from a standstill to 62mph in 12.1 seconds, before maxing out at 109mph. It’s hardly likely to get your blood pumping, but it offers a hassle-free experience. The other petrol engine in the range is a bigger 1.0-litre unit that does without turbochargers. It’s not actually available just yet, but is expected soon. A solitary 1.5-litre diesel engine rounds off the range. It produces up to 88bhp, and has a bit more pulling power than the equivalent petrol. It’s nippy, but you will need to change gear fairly frequently, as all of its power is derived from down low. The exterior has been given a makeover, and so has the interior. It had to if the Micra was going to represent a serious challenge to the bestsellers in this class. Its cabin benefits from a new, stylish design, while quality is much improved. There is also ample new technology included which brings the Micra nicely up to date with its rivals. The interfaces are simple and attractive, and there is a heap of standard kit included in the purchase price. The steering wheel and driver’s seat are adjustable, there is plenty of space, and the cabin is well-insulted. Indeed, you can rev the engine hard and still hear only a very faint trace of its puff. Nissan clearly love their new dashboard – they’ve actually named it! Gliding Wing is easier on the eye than past Micra dashboards, and creates a greater sense of width. Meanwhile, you’ll either love or question the addition of a flat-bottomed steering wheel. We like it, but some of you might find it a bit gimmicky. An interesting feature is the pair of contrasting colour zones that split the dashboard effectively into two areas. It’s tastefully done, and very quirky. Overall, the materials used are soft to touch, and everything feels mostly upmarket. A job well done by Nissan. The Micra is still as small as you remember it – but still as practical, too. In fact, it’s more usable than ever. There is now more room upfront and in the rear, and anything that made the previous model feel claustrophobic has now gone. However, the stylish new design of the car does come at a slight cost. The sleek roofline, for example, impinges on backseat headroom a little. Taller passengers might struggle. The boot measures 300-litres, which makes it one of the biggest in its class. But it’s let down by a flimsy parcel shelf that feels as though it could crumble under the weight of a shopping bag. Moreover, when you lower the back seats for more space, a pronounced step at the bottom of the boot appears. A high loading lip is also unwanted. Standard equipment is good, and includes a colour TFT screen fitted into the instrument cluster, a steering wheel packed with buttons, a 7” colour screen, Apple CarPlay and Bluetooth connectivity. You also get Lane-keeping assistance, auto-dipping headlights, traffic-sign recognition and blind-spot warning. Optional extras include a Bose six-speaker personal stereo. Nissan have kept details of the rest of their options under wraps. Prices for the new car start out from £13,700. If you prefer to lease, you can pick up a deal from as little as £110. For more information on our leasing deals, you can check out our page here. Perhaps you learned to drive in a Nissan Micra. Many of us did. One of the reasons for this is its affordability. The Micra has always been cheap as chips to run, and keeps the trend going here. The 0.9-litre IG-T 90 petrol engine is anticipated to be the most popular with buyers, and with average fuel economy returns of 61.4mpg, it’s easy to see why. It’s easy to drive, but it will cost a fair bit to tax when compared with the prices we’ve all been enjoying these past few years. Because it will be tricky to get a 2017 Micra registered before April, you can expect to pay out £120 a year in road tax. If you don’t fancy that tax bill, the 1.5-litre diesel engine is an option. It can achieve fuel economy returns of 88.3mpg, and doesn’t cost a penny to tax. 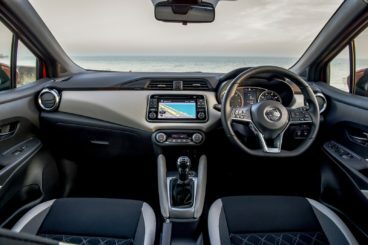 Part of the Micra’s 2017 makeover is a fresh interior that’s bright, colourful and fun. The Micra hasn’t been a mainstay of Nissan’s range all these years without good reason. It’s always been a useful car, and that remains the case here. If you need your small car to come with good luggage room and decent space for all, it’s got you covered. Wanna look and feel good on the road? The dynamic-looking new Micra has got your back. The newfound sense of style comes at a bit of a cost, as the sloping roofline impinges on headroom. It’s a slightly botched job by Nissan. For all its stylistic improvements, the Micra still remains a more-or-less uninspiring driving experience. For heaps of fun, check out the Ford Fiesta Hatchback. Let’s see how the car fares against its rivals in the comparison section of our Nissan Micra Hatchback review. 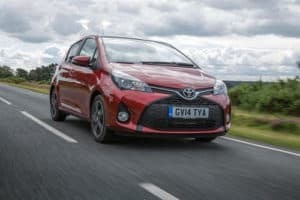 The new Toyota Yaris Hatchback is ideal if you need a new small car to get you to work, the shops and school to back without any hassle. It’s affordable, reliable and looks better than last time. The Yaris isn’t entertaining to drive, but it is hassle-free. It’s easy to drive, and its tight turning circle make it a cinch to wiggle you through the city. Parking is easy thanks to its compact dimensions and good visibility, although a reversing camera isn’t standard on all models. The engine range opens up with an underpowered 1.0-litre petrol that should be all but ignored unless you’re operating on a strict budget and don’t mind a 0-62 time of over 15 seconds. Its lethargy doesn’t inspire confidence as you try to overtake, and for this reason we much prefer a 1.33-litre petrol that is quiet and which can do 0-62 in 11.7 seconds. The 1.4-litre diesel engine is the quickest in the line-up. It can get you from a standstill to 62mph in a sprightly 10.8 seconds, but because it has such a spring in its step it feels even quicker than that. It costs more outright than the diesel engines, but because it gives you confidence both in the city and on the motorway, it’s the engine we recommend to compete with the Micra. Low running costs are a trait of the Yaris. There isn’t a huge selection of engines to choose from, but a hybrid model is by far the cheapest to. Average fuel economy returns of 85.6mpg and exemption from tax will be very appealing to first-time buyers and parents. However, the more performative 1.4-litre diesel engine is also frugal, and can return 80.7mpg. It’s also free from road tax. Another reason we’d be tempted to overlook the hybrid is that it’s a tad noisy. Make no mistake – none of the Yaris models are whisper-quiet, but the hybrid emits more of a rumble than the others. Still, the Yaris is on the whole a comfortable car. You benefit from softer suspension, while the adjustable steering wheel and driver’s seat let you get into the right position. The cabin is clearly well put-together, but rivals get treated to more high-quality materials. It is stylish, although it’s not as funky as the Micra. The new Toyota Yaris Hatchback is available as either a three-door or a five-door model. It’s bigger than the outgoing model, which means improved practicality. Rear-seated passengers have almost as much space as those in the back of a Ford Focus, although Toyota have decided to remove the rear sliding seat. The boot measures 286-litres, which makes it just smaller than the Micra’s. It’s bigger than the VW Polo’s, though, and comes with a large opening. A tall load lip is a nuisance, though. Split-folding rear seats are standard on all models. 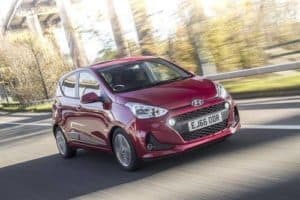 The new Hyundai i10 Hatchback is a fantastic small hatchback which boasts a good amount of cabin space, good looks, and affordability. The i10 has undergone a few changes to make its driving experience better. It’s now much more comfortable, its steering is more precise, and good visibility ensures that it’s easy to park. While there are no thrills and spills to be had here, this is a very easy car to drive around town. There are no diesel engines in the range, so your choice is limited to a handful of petrol models. Our top pick is a 1.2-litre 86bhp unit that can get you from a rest to 62mph in 12.3 seconds, and which is comfortable even when you put your foot down. As well as there being no diesels, there are also no turbochargers. When you consider that rivals in this sector have pretty much all added turbochargers, it weakens the i10’s appeal somewhat. However, running costs are still very good, with the cars small size and small engines helping to keep the figures down. No model costs more than £130 to tax each year, and Hyundai are widely known for offering an awesome warranty. The cheapest model to run is the 1.0-litre 65bhp engine, which averages fuel economy returns of 60.1mpg, and costs just £20 a year in road tax. The interior is relaxing, comfortable and quiet, and sports a smart design. It’s a lot better than past Hyundai cabins, and were impressed by the materials used. Build quality is good, and the i10 looks like a car that can cope with the demands of everyday life. The dash can be coloured red or bright blue, and these colours add brightness and a sense of fun to the cabin. The i10 is also a practical car. Its boost measures 252-litres, which is smaller than the Micra’s but the biggest in the city car sector. If you fold the rear seats, you can extend that space to 1,046-litres. The steering wheel is rake adjustable, the drivers seat is height adjustable, and this ensures good visibility. You can only get the i10 as a five-door, but this only enhances its usability. Two adults will be comfortable enough in the rear, and there is a good amount of head, leg and knee room throughout the cabin. Nissan have taken a lot of care with this product, and it’s clearly their aim to restore the humble Micra as one of Europe’s best small cars. It’s been a part of their range for a long time, but you got the impression that it had almost become the unwanted child. Not anymore. In 2017, the new Micra fizzes with excitement. It’s had a refresh and now stands out in a visually appealing market. And there’s a reason why it’s popular with driving schools – it’s affordable and easy to drive. If you want to get out and about without any fuss while feeling and looking great on the road, the new Nissan Micra Hatchback is a fab choice. Looking For A Price For The Nissan Micra Hatchback Diesel?